Homeowners and Businesses are constantly moving. We know the importance of choosing the proper moving company. relocation process, leaving you in complete control. We know the importance of choosing the proper moving company. Choosing Reasonable Movers will allow you to streamline your entire relocation process, leaving you in complete control. If moving into a white carpeted house ask for floor runners. 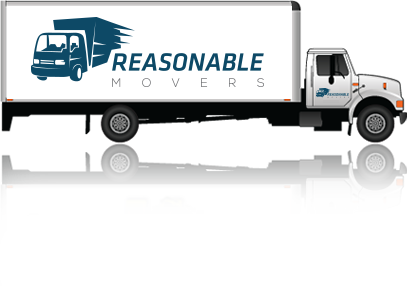 Thank you for choosing Reasonable Movers, "The only way to move". We offer premier relocation services for every moving need. From residential, commercial, retail stores, auto transports, and light industrial equipment, expect the best with Reasonable Movers. Moving out of sate? Do you have a move that may take more than 1 day? Be sure to ask about our "flat rate packages". Know how much you're paying in advance by having the security of a "fixed rate". No surprise additional charges. Is packing needed? Our professional packing services make your move as smooth as possible. Just think of having all your packing done in 1 day. Want to pack yourself? We stock an array of supplies for all your packing & moving needs including expert advice to answer any of your packing questions. So when you are getting ready to plan your next move, make the only move with Reasonable Movers and leave your "stress", behind.